On the occasion of the 75th anniversary of the Spanish Revolution, our friend and collaborator Agustín Guillamón was interviewed by the editors of the website alasbarricadas.org about his latest book, Los Comités de Defensa de la CNT en Barcelona (1933-1938). 6. Investigator to determine where to obtain arms, money and supplies. It was thought that this number of six militants was the ideal figure for a defense group or team, with the proviso that, in certain cases, one more member could be added for “relief” purposes. Absolute secrecy was mandatory. These groups were the basic core groups of a revolutionary army, capable of mobilizing more numerous secondary groups, and these, in turn, were to mobilize the entire population. The defense group was the basic cell of this clandestine military structure of the CNT, composed of six militants. Its responsibilities were very precisely demarcated within each neighborhood. In each neighborhood a district Defense Committee was formed, which coordinated all these defense cadres, and which received a monthly report from the Secretary of each Defense Committee. The Secretary-Delegate of the district drafted a summary report that he delivered to the District Committee; and the latter, in turn, passed it on to the Local Defense Committee “and the latter passed it on to the Regional and National Defense Committees, respectively”. 2. Logistics in the broadest meaning of the term, from assuring the basic needs of the population and running soup kitchens to the establishment and maintenance of hospitals, schools, cultural centers … and even, during the early stages of the revolution, the recruitment of militias and the provisioning of the columns leaving for the front. In January 1935, the anarchist groups, Indomables, Nervio, Nosotros, Tierra Libre and Germen, at a Plenum of the Federation of Anarchist Groups of Barcelona, formed the Local Committee for Revolutionary Preparedness. The Plenum, confronted by some truly discouraging historical developments—the rise of fascism in Italy, Nazism in Germany, Stalinism in the Soviet Union, and the economic depression accompanied by mass long-term unemployment in the United States and Europe—drafted a Report that opposed these developments with the hope of the revolutionary proletariat. It said: “Amidst the generalized collapse of ideals, parties, and systems, only the revolutionary proletariat remains standing with its program of the reorganization of the foundations of labor and economic and social reality, and solidarity”. Revolutionary preparation for a long civil war required that the comrades confront new challenges that were unthinkable in the framework of the old tactics of the armed groups. The Report said: “In view of the fact that it is not possible to possess in advance the stockpiles of weapons necessary for sustained combat, the Preparedness Committee must undertake a study of how to convert industries in certain strategic zones […] into industries that are capable of providing war materiel for the revolution”. This was the origin of the Commission of War Industries, formed on August 7, 1936, which created a powerful military industry from scratch thanks to the efforts of the workers, coordinated by the CNT’s Eugenio Vallejo Isla, a metal worker, Manuel Martí Pallarés, of the Chemical Workers Union, and Mariano Martín Izquierdo; the responsibility for this achievement was subsequently claimed by bourgeois politicians (Josep Tarradellas), and while it is true that they did contribute to its success, it was “primarily due to the workers in the factories, and to the technicians, whose responsible delegates were granted managerial authority by the CNT from the beginning of the war”. From the action groups and gunmen who practiced a revolutionary gymnastics prior to 1934, the CNT had passed to the creation of information and combat cadres that were viewed as the basic cells of a revolutionary army. This was the real final balance sheet of the achievements of the CCMA after its nine weeks of existence: the transition from revolutionary local committees, which exercised total power in the streets and the factories, to their dissolution to the exclusive benefit of the full reestablishment of the power of the Generalitat. Furthermore, the decrees signed on October 24 on the militarization of the Militias as of November 1 and the promulgation of the Collectivization decree completed the disastrous balance sheet of the CCMA, that is, the transition from volunteer revolutionary workers Militias to a bourgeois army of the classical type, subject to the monarchist code of military justice, under the command of the Generalitat; the transition from the expropriations and workers control of the factories to a centralized economy, controlled and administered by the Generalitat. Comorera blamed the defense committees for the shortages and high prices of food, rather than the hoarding and speculation of the shopkeepers. His speech justified and served as an explanation for the slogan that had appeared on placards and posters in women’s demonstrations that took place in late 1936 and early 1937—“more bread and fewer committees”—demonstrations that were promoted and manipulated by the PSUC. It was clear that there would be a confrontation between the two opposed provisions policies, that of the PSUC and that of the Food Workers Trade Union of the CNT. The Food Workers Trade Union, through the thirteen provisions warehouses in the various districts of the city that were under the control of the revolutionary neighborhood committees (or, more accurately, of the district defense committees), delivered free food to the people’s kitchens, which fed the unemployed and their families, and also served the needs of the refugees who, in April 1937, already numbered 220,000 in Barcelona. It was a network of provisioning that rivaled the retail shops, which only responded to the law of supply and demand; the revolutionary institutions attempted, above all, to prevent the prices of necessities from rising too high, which rendered many products inaccessible for the workers and, of course, for the unemployed and the refugees. The black market was the biggest business arena for the shopkeepers, who made excellent profits thanks to the hunger of the majority of the population. Comorera’s war for bread waged against the district provisioning committees had no other objective than that of stripping the defense committees of every shred of power, even at the cost of depriving Barcelona of food and other basic necessities. 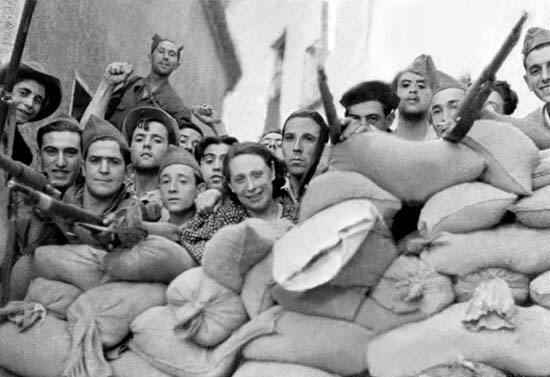 The Friends of Durruti did not start the insurrection, but its members were the most active combatants on the barricades, and distributed a leaflet demanding the replacement of the Government of the Generalitat by a Revolutionary Committee. The confederal workers, disoriented by the appeals of their leaders—the same ones they had on July 19!—chose, in the end, to give up the struggle, although at first they had laughed at the calls of the CNT leadership for peace and for the end of the fighting, in the interests of antifascist unity. 4. Against certain well known officials of the CNT, such as Aurelio Fernández, Barriobero, Eroles, Devesa, etc. This is a brilliant interview. Many thanks for translating this and posting it! Excellent I'm reading the book in Spanish right now so this will help add some context. Thank you for this article. It will surely help our discussions, in particular, to get a better handle on what forces we face today, and what we might expect from them. The English translation of this book has just come out on AK Press. Called Ready for Revolution. Well worth getting hold of. "... there was a constant battle between the militant anarchist working class who could see that everything they had given their blood for being taken away by a bourgeoisie aided by a heavily armed Stalinist police force trying to re-establish their control and wipe out the Committees and the ‘uncontrollables’. The ‘May Days’ of 1937 were inevitable. With the exception of the ‘Friends of Durruti’, the May Days exposed the total lack of ideas and any sort of programme from the CNT leadership save more collaboration and laying down your weapons! After May it wasn’t long before their Committees were wiped out and any sign of working class power was gone forever."